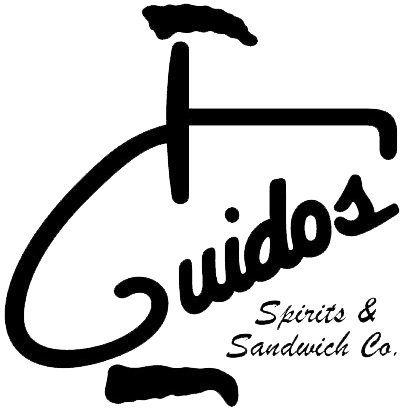 Welcome to Guido's Spirits and Sandwich! | Come Enjoy a Cold Beverage and a Delicious Meal with Friends! Battered nuggets filled with jalapeno, corn, red peppers and a cheese blend. Served with a Sriracha honey mayo sauce. Made from scratch, filled with cream cheese and jalapenos then deep fried to perfection! Slightly seasoned crinkle cut fries. Battered jalapenos sliced and deep fried. Lightly seasoned battered cheddar cheese curd. Delicious deep fried cheese stuffed bread sticks. Garlic buttered and sprinkled with Parmesan blend. Seasoned mini hash rounds. Light & delicious. Stuffed pepper jack jalapeno or pizza. Battered deep fried green beans.. You have to try this with wasabi ranch. Includes french fries, onion petals, cheese curd, mini tacos, cheddar munchers and baby cakes. Your choice of French, Ranch, Thousand Island, Blue Cheese or Honey Mustard dressing. Crisp lettuce, tomatoes, onions, green pepper, black olives and ham topped with a cheese blend. Grilled or breaded chicken on crisp lettuce with tomatoes, onions, green pepper and black olives. Topped off with cheddar cheese. Make it a basket! Add fries to any sandwich/burger for $1.50, or choose onion petals, munchers, cole slaw or potato salad. All sandwiches are served with lettuce, tomatoes and onion on request, all served with pickle. Add one of our signature sauces: Chipotle Blend, Guido's Sauce (with hint of garlic), BBQ sauce, Mayo or Ranch, Jalapeno Ranch, Salsa, Sour Cream, or Wasabi Ranch. A 6 oz. certified Angus beef filet butterflied and cooked your way-try with fried onion and mushrooms. Four fish filets batter dipped and deep fried on a soft hoagie bun served with a side of tartar. Add cheese to change it up! Marinated in our own spices for a great flavor. Our marinated chicken breast just got better - covered with crispy bacon and mozzarella cheese. You Choose! Our marinated or crispy chicken breast, piled high with lean ham and topped off with Swiss cheese. Served with a side of Ranch. For those who like the original. Crispy breading surrounds our all white breast meat. May we suggest trying it with our Chipotle sauce? Have it 2 ways, breaded with cheddar and ranch or spicy with pepper jack cheese and jalapeno ranch dressing. Smothered in our own pizza sauce, topped off with a Parmesan blend and mozzarella cheese. American favorite. Simple & good. Isn't it silly not to try our Philly? Lean beef, onions and green peppers topped off with 2 slices of mozzarella cheese. Try it with one of our signature sauces. Mmm...Tender lean beef piled on our toasted hoagie bun with your choice of cheese. Lean ham piled on a hoagie with your choice of cheese. Not just any BLT, but a triple decker. Loaded and ready to please. 1/2 pound foot-long all beef hot dog. 1/2 pound foot-long beef hot dog with chili and cheese. 1/2 pound foot-long beef hot dog with tomato, relish, banana peppers, onion and celery salt. 12 butterfly shrimp with French fries, cole slaw, or potato salad. Breaded cod deep fried w/french fries, baby cakes or potato salad, and your choice of either coleslaw or applesauce and rye bread. Lightly breaded butterflied perch dinner with French fries, cole slaw and rye bread. Make it a basket! Add fries to any sandwich/burger for $1.50, or choose onion petals, munchers, coleslaw or potato salad. 1/2 pound grilled burger with cheddar, hickory smoked bacon, fried onions & Guido's secret sauce. 1/2 pound burger. Lean and juicy bring your bib!! Beef burger smothered with your choice of American, Swiss, Mozzarella, Pepper Jack or Cheddar Cheese. Beef burger smothered in with your choice of American, Swiss, mozzarella, pepper jack or cheddar cheese with hickory smoked bacon. Loaded with sauteed garlic and mushrooms and topped off with Swiss cheese. 1/2lb burger with our special pizza sauce, topped with mozzarella cheese. Loaded high with jalapenos, jalapeno ranch dressing, and topped off with pepper jack cheese. Served on marble rye bread with fried onions and your choice of cheese with a side of homemade Thousand Island dressing. 1/4 lb. Brat Patty on top of 1/3 lb. C.A.B. burger cooked to perfection. Mediterranean seasoned turkey meat with a great unique taste. May we suggest a side of salsa? Loaded high with jalapenos, jalapeno ranch dressing and topped with pepper jack cheese. A hearty combination of pepperoni, onion, mushroom, sausage, green pepper, and black olives. Creamy alfredo sauce, chicken, bacon, onion and green peppers. Pepperoni, sausage, bacon, hamburger and Canadian bacon. Lemonade, Pineapple, Orange, Grapefruit and Cranberry. All kids meals come with your choice of French fries or cinnamon applesauce and your choice of any fountain soda.